If you live in Utah, please come and take these away from me. 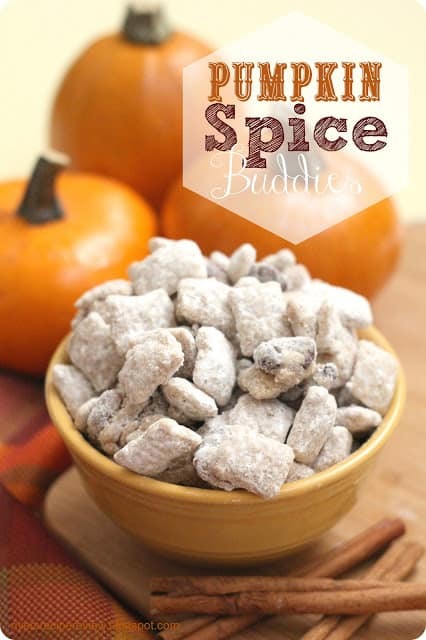 I am obsessed with muddy buddies, but this takes muddy buddies to a ‘whole nother level’. I seriously just found the BEST fall snack ever invented. They are so easy and addicting. These are made with cinnamon chex mix and oh my. These are good! Make them and join me in my new addiction. How I changed them: I added about half as much of the chex they required because I felt like my chocolate wouldn’t cover them all. I also added a little more powdered sugar. A delicious and addicting snack with a delicious fall spice that you won't be able to get enough of! OMG! I’m totally going to have to make this. Looks sooo good! 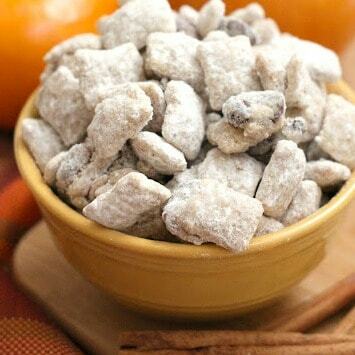 I love muddy buddies, I am sure these will be dangerous in my house! Thank you so much for linking up to Sunday’s Sweet Confessions over at mommy’s sweet confessions! Have a great day! Brilliant idea! I love pumpkin flavored treats. These look great! Is the chocolate clumping?? It means it is cooking the chocolate too long and at too high of a temperature. White chocolate chips don’t melt the same as regular ones. It helps to add a little fat to them. Vegetable oil works best for me – usually about a tablespoon per bag. Hope this helps. I was having the same problem when I was making them. What I did was over the stove top, I added some whole milk as needed. It turned out great! I also had to add some extra white chocolate chips because it wasn’t enough to cover the cereal. Where do you get pumpkin pie spice? at the regular grocery store? Thank you…can’t wait to make these! MAN I HAVE GONE MY MUDDY BUDDY CRAZY !!! SOMEONE HELP ME LOL ! !